Wear #RedforFeds on Wednesday to show your support for IAM federal workers and their rights on the job. Federal employees and their supporters across the country are asked to wear something red in solidarity for the rights of federal employees, including the right to legitimate representation, due process, and a meaningful voice in the workplace. 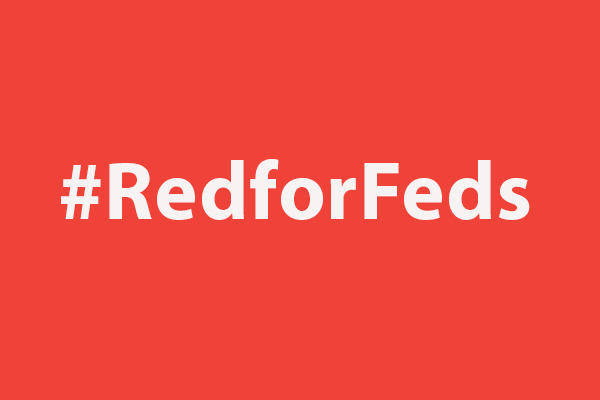 The #RedforFeds event is in response to the three Executive Orders released last May that target the voice and strength of union members by directing agencies to supersede existing laws that govern federal employee labor. In addition to wearing red, NFFE-IAM and other federal employee unions will rally from 12:30 to 2 p.m. at John Marshall Park outside of the U.S. District Court for the District of Columbia, 333 Constitution Ave. NW, Washington, DC.